Sri Lanka is fighting a losing battle with dengue as intermittent rains are sending the number of men, women and children affected by this mosquito-borne disease soaring. Into 2½ months of the year, the number of dengue cases is reported to be 21,000, the highest ever the country has experienced for similar periods in other years, while the death toll is also rising steadily, more than what has been seen in the last three years. Amidst the doom and gloom of the dengue situation, there has been a silver lining to the dark clouds, with a gesture of support from a coastal town on the west to a coastal town on the east. It began with a visit by the President of the Sri Lanka College of Paediatricians (SLCP), Dr. Lak Kumar Fernando, from his base in Gampaha and honorary work in Negombo to both Trincomalee and Kinniya this week, along with the National Coordinator for Dengue, Dr Hasitha Tissera. Hearing about a major ‘humanitarian crisis’ caused by the dengue epidemic in both these eastern coastal towns, they paid a visit to this beleaguered area on Sunday and Monday. 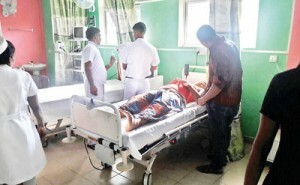 By that time, more than 12 people had succumbed to dengue in Kinniya alone and patients were more inclined to rush to Trincomalee, but very fast that hospital too was filling up, with deaths there as well. What Dr. Fernando saw left him in shock, and this was a dengue expert who had seen numerous patients and also been instrumental in setting up the state-of-the-art ‘Centre for Clinical Management of Dengue and Dengue Haemorrhagic Fever’ for both adults and children at the Negombo General Hospital in June 2013. “A major epidemic of dengue is sweeping across Trincomalee and Kinniya and the two hospitals are flooded with patients requiring meticulous monitoring,” says Dr. Fernando, adding that he found that the staff was stretched beyond their very limits and battling against heavy odds. Painting a grim picture not only with regard to the dengue situation in these two areas but also commending the Herculean effort of the hospital, he says that with the dengue epidemic raging for two to three weeks, he found that medical, nursing and other staff members had been working long and weary hours leading to physical and mental exhaustion. The number of junior doctors was by no means adequate to handle the influx of patients. 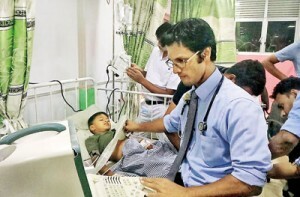 Seeing their urgent need, Dr. Fernando simply could not come back to Gampaha and Negombo and go about his work unmoved. It was then that he decided that he would request all those dedicated staff members who had made the Negombo Dengue Unit what it is today to go out there and help their brother and sister medics of the east to face the caseloads they were burdened with. 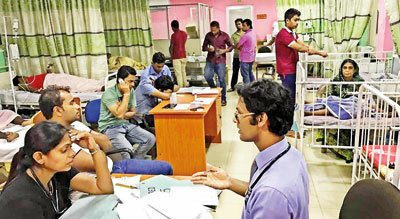 It was then that quick thinking and an urgency to help took root – with Kinniya Hospital’s gynaecological ward being turned into a ‘Dengue High Dependency Unit’ to monitor severely-ill dengue patients, as the medical wards were full up. “What I had in mind was the model I have in Negombo, the Centre for Clinical Management of Dengue & Dengue Haemorrhagic Fever, where patients of all ages are treated by a common team of doctors and nurses using the same treatment principles,” says Dr. Fernando commending Kinniya Hospital’s Medical Superintendent and a politician of the area for their prompt action. This little space was converted to the unit and on Friday morning, a team from the SLCP who had rushed from Colombo had established it on the model of the Negombo unit. Just for a week, sending doctors with dengue expertise on a rotation system was what Dr. Fernando visualized and sent out an urgent appeal with a very positive response not only from senior doctors who parted with some of their junior staff but also junior medics to help colleagues in need. The team was formed from doctors drawn from the Negombo, Ragama, Gampaha, Peradeniya and Ratnapura Hospitals. The Health Ministry response too was equally prompt with a portable scanner, multi-monitors and infusion pumps, centrifuge and beds and cots being sent immediately. By Friday afternoon, the first patient was admitted to this unit which comprises seven beds and three cots to enable both adult and paediatric treatment of patients being set in motion along with the untiring efforts of Kinniya’s Physician Dr. Sriram and the Paediatrics Senior Registrar Dr. Sivashakthi. As a microcosm of the successful Negombo dengue unit — the first treatment facility in the world that cares for both children and adults affected by dengue by a common team of nurses and doctors – is duplicated in Kinniya, Dr. Fernando hopes that it could be sustained at least till the dengue epidemic ends. “We want to help Trincomalee too but as we could find only six people to go to the east, this was all that was possible,” he adds, comforted by the fact that no more patients are being transferred from Kinniya to Trincomalee.